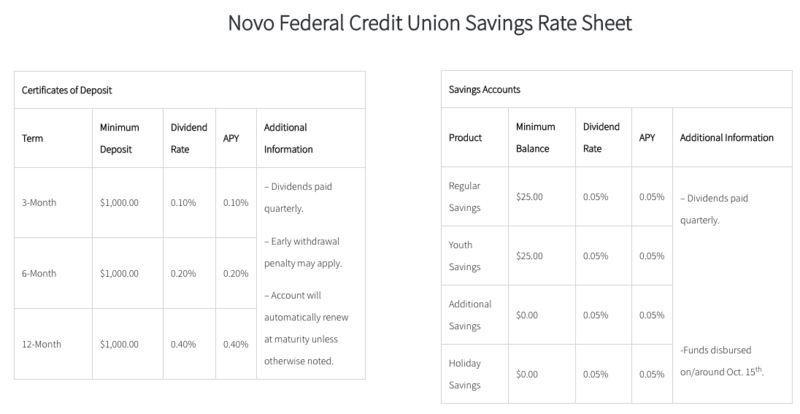 Whether you need help financing a new car, establishing new credit, setting up a Share Certificate or just opening a new checking or savings account, Novo Federal Credit Union can help you. We offer a host of financial products and services. We have a reliable partner that can offer VA, Fixed, Adjustable, HARP, FHA, Jumbo and Reverse Mortgage options . For rate and application information click here. 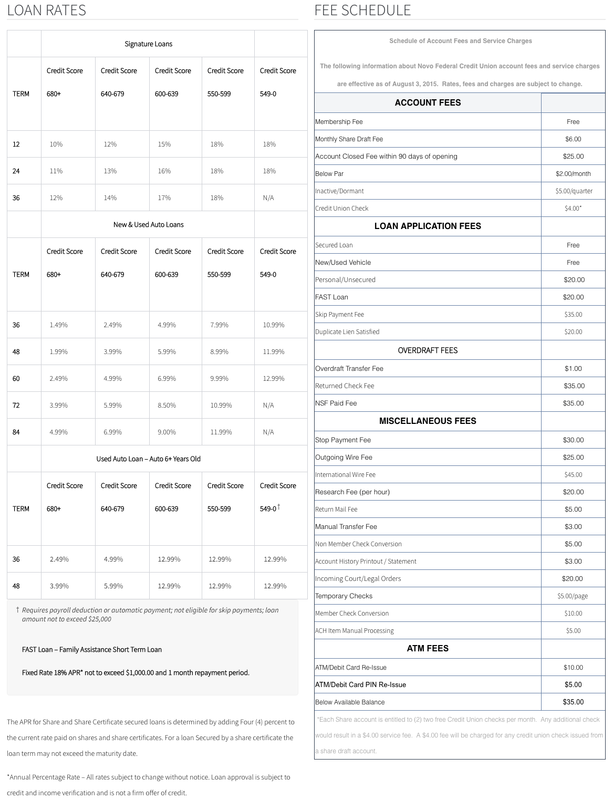 See our Rates for our current New Auto Loan rates. Repayment terms up to 84 months. Financing available up to 100% percent of purchase price plus tax, license and fees. Apply online from our website! See our Rates page for our current Used Auto Loan rates. Repayment terms up to 72 months. Financing available up to 100% percent of purchase price (using NADA clean retail value) plus tax, license and fees. Apply online from our website! Whether you want to consolidate your credit card debt or get started on your next home improvement project, our personal unsecured loan is right for you. With today’s high interest credit cards you’ll find our rates are very competitive (see our Rates page for current rates). Maximum term up to 36 months. FAST loans offer a short term, fixed loan rate and borrowing amount up to $1,000.00. A $20 application fee will be collected when the FAST loan application is turned in. The application process is quick and easy. Apply online today or contact us at 951.737.6262 for more information. Share or share certificate secured loans allow you to borrow against money you have already saved. Maximum term 60 months. Teach your children the value of saving! A youth saver account is designed to help young people understand the value of money, and to help families and individuals plan for important expenditures in the future. Whether you just need a place to stash cash short term or you’re looking for long-term savings your Credit Union has what you need. Set up a monthly payroll deduction from your check to get started. A sub-account specifically designated for Christmas. It can be opened any time and funds are disbursed to your regular shares on or about October 15th each year, in plenty of time for Christmas. For a low monthly premium added to your loan balance, credit life insurance pays the insured balance of your loan, up to the policy maximum, in the event of your death. This ensures your family will not be left with your loan debt. Ask a credit union loan officer for details. In the event you become totally disabled by sickness or an accident, credit disability insurance pays your loan payments up to the policy maximum. The premium for this service is added to your regular loan payments. For full policy details please contact the credit union. Auto Insurance might not be enough. An affordable way to fill the GAP is to purchase GAP Protection. You might have to pay thousands of dollars on a vehicle lost to theft or accident. The cost is only $299. For a few dollars a month, you can protect yourself against this kind of unexpected expense. It’s easy to get. Call the Credit Union for details today. When you purchase a vehicle, you want it to last as long as possible. You can extend the life of your vehicle and save on covered repairs with MEMBERS CHOICE Mechanical Repair Coverage (MRC) made available through Novo Federal Credit Union. With this coverage you can lock-in repair costs to limit the amount you have to pay for unexpected breakdowns. Your membership at Novo Federal Credit Union affords you many benefits. Two of these benefits is the availability of Life Insurance and Accidental Death & Dismemberment (AD&D) Insurance. At Novo Federal Credit Union, we believe in your financial security. That’s why we’ve made available this important coverage to help protect your future. As part of our family, you can get valuable protection at affordable rates. Insurance is sold by CUNA Mutual Insurance Society. This insurance is not a deposit and is not federally insured or guaranteed by your credit union. As a credit union member, you’re part of a special group of people that can enjoy the benefits of customized auto insurance protection-all at the competitive group rates. All you need to do is call 1-888-380-9287 to obtain a free rate quote-it’s that easy! © 2017 – Novo Federal Credit Union.